Learning and leadership are in a constant state of change. Results today are no guarantee of success tomorrow. Now more than ever, CLOs are critical to a growing set of crucial organizational imperatives, from employee development to talent management and workplace culture. Learning is no longer defined by traditional bounds, happening at set times with specific people in certain conditions. Join us at the 2016 Spring Chief Learning Officer Symposium as we explore how learning is being redefined – by our times, by our organizations and employees and by us. Whether you are a director of training who aspires to the CLO role or a business manager new to your role as training leader, you need a vision and the tools to execute. Accelerate your development with this new pre-conference workshop from Chief Learning Officer, developed in partnership with Gerry Hudson-Martin, a former senior training officer at John Hancock Financial Services and Marriott International. Learn leadership principles from several experienced Chief Learning Officers, including a fireside chat with a “CLO of the Year” on the first evening. Develop a plan for ongoing personal development and a plan for the training organization’s development. The workshop will take place on April 2-3, 2016. The 2016 Spring CLO Symposium will take place at the The Ritz-Carlton, Amelia Island on April 4-6, 2016. I bought my first smartphone in January 2013 (yes, I was a little slow), and I quickly got excited about all the things I could do with it: Check baseball scores, find weather forecasts, listen to podcasts, and occasionally even call people. I decided I would build my professional life around this amazing new tool, and I was soon using it to take notes in meetings, schedule client visits, and answer emails. I began to imagine a future where I didn’t need a computer at all – my smartphone would be my only device. I was about three months into this personal technological revolution when I realized that just because I COULD do things on my phone didn’t mean I SHOULD. The notes I took in meetings suffered because I couldn’t get everything transcribed as quickly as when I wrote in my notebook, and the emails I wrote took much longer since, as a punctuation-obsessed English major, I made sure to use every Oxford comma. So I began scaling back. I took pen and paper to meetings, I wrote emails from my desk computer, and I’m writing this blog post on a tablet. I still love my phone –it has revolutionized the way I watch baseball, and I’m never going back–, but I no longer think it’s the right tool for every task. Turns out I’m not the only one. Americans still use smartphones a lot – a recent eMarketer report said it roughly averages out to three hours a day in 2015. And the amount we use them is still increasing, but the growth rate has slowed considerably in the last five years, from 100% growth rate between 2011 and 2012 to just over 10% growth rate between 2014 and 2015. Even more revealing is how we now spend that time. A sizable majority is spent engaging with video, audio, and social networks – we still like those tasks designed for smartphones, but we like less and less those that aren’t: Time spent surfing the web on smartphones has declined in the last 3 years. All this is to say, we are being more discriminating about how we use our smartphones and when we want other tools more suited to a specific task. This is an important lesson for training. There are certain training tasks that work very well on a phone; some even require a mobile device of some kind. One of our clients, a major telecom company, recently needed Performance Support Tools (PSTs) for their technicians who were running into unfamiliar situations when connecting service for new customers. No matter how detailed the walk-through in a classroom setting, it was often impossible to remember all the steps out in the field. So they produced a series of smartphone training videos, meaning training videos that could be easily accessed on smartphones, showing the technicians every step they would need for a variety of installation scenarios. Many other training tasks are less suited for smartphones. Complex concepts often require conversation with experts or peers, so they work well in face-to-face settings. In-depth application of principles to detailed scenarios requires significant interaction and will work best on a desktop or laptop where interactivity is less cumbersome. Detailed overviews can be effectively shown in interactive infographics, but they require a large screen to effectively absorb the big picture. Simply put, the physical setting of our training matters, especially when we are considering smartphone training: If a salesperson is going to be sitting with a customer, showing a brief product video on a smartphone can be a nice, impromptu training session. Our client’s technicians benefited greatly from the ability to pull up process tools in the field. But if we want smartphone training because our learners aren’t doing anything else while they ride the train home anyway, let’s rethink. We want our learners to be in a setting that maximizes the learning potential by providing the most effective interactivity with the right tools. Let’s not use smartphones for training because we can. Let’s use them when we should. Want to learn more about other top 10 training trends? Check out AllenComm’s #Trending 2016 eBook. Great Article: Burnout and the Brain by Alexandra Michel, writing in The Observer, a publication of The Association for Psychological Science. Stress may cause changes in the brain. Studies were mostly correlational, so not clear whether there is cause-and-effect relationship. "a comprehensive report on psychosocial stress in the workplace published by the World Health Organization identified consistent evidence that 'high job demands, low control, and effort–reward imbalance are risk factors for mental and physical health problems.' Ultimately, burnout results when the balance of deadlines, demands, working hours, and other stressors outstrips rewards, recognition, and relaxation." If we want our organization's employees to work at their best, we can't put them under long-periods of stress. We need to give them more control of their work, reward them appropriately especially with recognition and status (not necessarily with money), promote periods of rest and relaxation, and give employees input into their job environment. CoSN 2016: "Accelerating Success: Powered by an eLearning Culture"
Technology is constantly changing the way students learn and teachers teach. School systems are in the midst of a digital leap, moving away from the traditional into the world of e-learning. The success of this shift depends as much on the people and culture of the system as it does on the technology used. The CoSN 2016 Annual Conference will focus on the ways that school systems can change their organizational cultures, embrace a culture of digital options, and accelerate success. Attend the CoSN 2016 Annual Conference and surround yourself with colleagues from across the country while engaging in comprehensive discussions about K-12 education technology. Maximize your technology investment and stretch your dollars. Content – Discover and explore a wealth of relevant interest areas and topics in K-12 education technology to find out what you’ve been missing. Speakers – Hear from experts in the field to expand awareness of challenges and identify opportunities to effect change at your school district. Network – Develop key relationships with colleagues in the education IT community through engaging in dialogue about the landscape of K-12 education technology. Community – Engage in a powerful, nationally recognized, solution-oriented member community through a variety of discussion groups, impromptu meetings, special programming, and pre- and post- conference events. Solutions – Stay up-to-date on emerging technologies @InnovationCentral where companies showcase their products and services. Who Should Attend CoSN 2016? CoSN 2016 includes 3 plenary sessions, dozens of breakout sessions, additional workshops, and pre- and post- conference events designed to maximize professional development for your entire school district team. Our conference environment enables a personalized and authentic learning environment with an emphasis on peer-to-peer sharing and networking. Content at a CoSN Conference is rooted in this team-oriented approach, so we encourage you to bring your school district team. The 2016 Consortium for School Networking Conference (CoSN 2016) will be held at theWashington Hilton Hotel on April 4- 7, 2016. While small and medium businesses, larger enterprises, NGOs, public and private organizations, etc. all have similar needs when it comes to employee training, they can also have widely differing organizational structures and modes of operation. Corporate culture, organizational size, geographic expansion - all these things influence how an organization is structured. A smaller business, for example, might operate from a single location, with only a handful of employees, while a larger enterprise might have multiple branches within the same building, or even multiple facilities all around the world. There are other aspects to this too. For example, some businesses, like Zappos, opt for a "flat" employee hierarchy. Others, like IBM, prefer a more rigid hierarchical model. The relative autonomy of each branch or facility can also vary between organizations - some being fully independent and others having close collaboration between them. For your LMS to perfectly fit your employee training needs, it needs to be able to properly model ("map into") your organizational structure and mode of operation. In this article, we're gonna examine the kind of tools TalentLMS gives you to achieve organizational mapping success. People are the most important asset of an enterprise or organization. They're also the ones that your training program is targeted at. TalentLMS affords you quite a lot of flexibility in how you model your users - flexibility that is not immediately evident from the "Add User" administration panel. There you'll find the typical user profile fields such as first and last name, email, bio (a short description of the employee), etc. A handy feature is the ability to mark a user as "active" or "inactive" (which can, for example, help you separate employees currently going through training from the ones that have already completed their training program). There's also a timezone setting - which you'll need for organizations that span multiple time-zones and/or countries. The real magic though happens in the inconspicuous "User Type" box, which not only allows you to define a user as an "SuperAdmin" (in charge of your LMS), "Admin-Type" (assistant to the first), "Trainer-Type" (your instructors) and "Learner-Type" (your learners), but also as your own, custom, User Types. To create these, you'll need to go to the aptly named "User Types" administration panel. 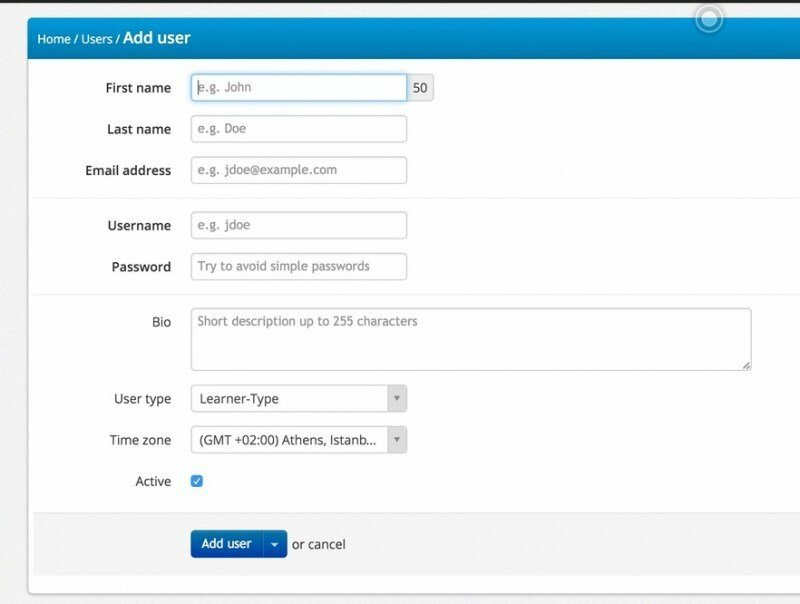 A custom user type can be based on either the Administrator, Instructor or Learner user type, and can be further configured with its own set of fine-grained permissions (from whether it will be allowed to create new courses, to being able to participate in the discussions forum). The key idea here is that User Types are not just useful to give your users their own permissions, but also as a method to create different sets of learners (like managers, engineers, assembly-liners, sellers, etc). 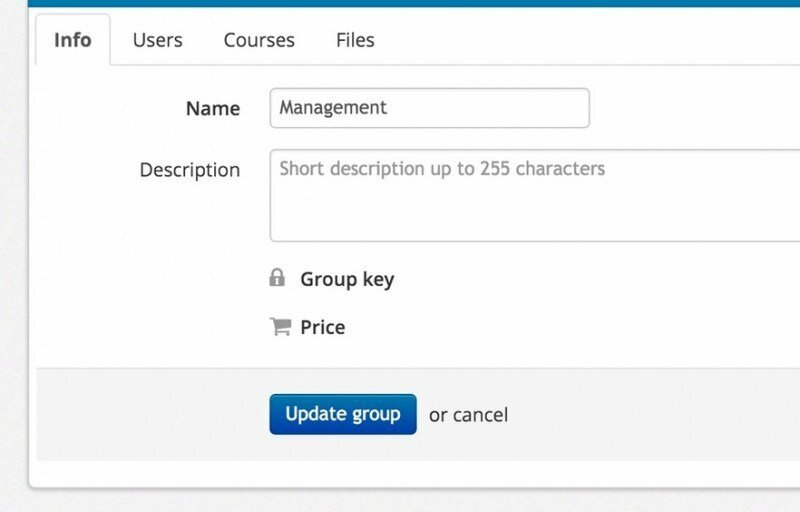 You can then take advantage of your custom user types to perform mass actions on users of the same type (group assignments, course assignments, etc. ), view reports on them, and much more. Plus, while User Types are "flat", there's nothing stopping you from modeling your organization's hierarchy with your own tree-like structure with them (e.g. by using user type names such as Manager.Level_A and Manager.Level_B, etc.). Categories are the main way to organize (and, well, categorize) your courses in TalentLMS. A course category has its own name reflecting its subject (e.g. Accounting) and an (optional) Parent category. Of course in an enterprise setting this can be used to reflect the structure of your business units and training program (e.g. Assembly line Training -> Product A, Product B). When it comes to selling courses, each category can also have a price set that helps you offer discounts to your users. The end-user will then see an option to purchase all courses of that category at the discounted rate. Besides User Types and Categories, which are meant for more low-level organization, Groups is another handy way to categorize your users and courses. Groups effectively allow you to manage users and courses belonging to the same group as a single entity, thus offering an efficient way to communicate with particular sets of users or to perform mass actions, e.g. to mass assign a number of courses to all the members of the "Management" group. A group can have a "key", a kind of id for the group, allowing users to self-register to the group and its classes, and an optional cap to the number of users that can join it ("Redemptions"). Groups also allow commercial eLearning operations to set and offer your end-users a sale price for a bundle of courses. Last, but not least, groups offer a file-sharing area, sot hat instructors can share documents (training material, instructions, time-tables etc.) to all users belonging to a group. TalentLMS "Branches" feature is perfect for modeling your organization's different departments, facilities, and, obviously, branches (it's just a name after all, the point is that it can be used to reflect different organization units). Branches are separate TalentLMS learning portals (belonging to the same main corporate account) that can have their own courses, theme, users, domain name and supervisor. This makes them appropriate not just for representing your different departments and branches, but also for any part of your business that requires its own branding. A branch can also have its own timezone which is then applied to all of its users (for facilities in different cities or countries). For online education businesses that sell courses catering to several different audiences, each branch can represent a different public face (e.g. design training, business training, etc. ), each with its own payment processor and monthly subscription pricing. This sums up the main organizations tools that TalentLMS offers. User types and User Groups help you model your different eLearning portal users. Branches help you model your organization's departments and facilities. Categories help you organize your courses. Between them (and by combining them), you can model almost any kind of enterprise structure and methods of operation. By using these organization features along with TalentLMS powerful content creation and re-use functionality, reporting, user administration and course management tools, you get perfect control of your training program and easy automation of all kinds of manual tasks. Open your own free account today, and see for yourself how TalentLMS can help you efficiently design, organize, and manage your enterprise training program. The UK-based training company, The Springboard Consultancy, has revealed that over 35,000 women in Australia have now experienced its ‘Springboard’ development programme. Was sagen eigentlich noch “Lebensläufe”, “Qualifikationen” und “Erfahrungen” über die Kompetenzen eines Kandidaten aus? Wenig, meint Doug Belshaw. In vielen Bereichen stellen Open Badges, jene digitalen Abzeichen für erworbene Fähigkeiten und Fertigkeiten, bessere, weil feinere Filter dar. “Granularity”, “evidence” und “portability” zählt er als Pluspunkte auf. Mag sein. In jedem Fall werden Netzprofile (LinkedIn, Xing, Blogs) mehr und mehr zu Ausgangspunkten auf dem Jobmarkt. Und ein Baustein dieser Präsenzen könnten auch Open Badges sein. Ich hatte Tony Bates schon im Ruhestand vermutet, was sich als großer Fehler entpuppte. Er präsentiert, reflektiert und schreibt wie eh und jeh. Viele seiner Aktivitäten hängen an seinem (offenen) Buch “Teaching in a Digital Age”. So auch diese Gedanken über Lernumgebungen. Tony Bates schickt ihnen zwei Prämissen vorweg: a) Lernen als eine “natürliche” Aktivität, und b) Lernen als fortlaufender, nie abgeschlossener Prozess. Vor diesem Hintergrund beschreibt er einige zentrale Bausteine von Lernumgebungen, mit denen sich Lehrende auseinandersetzen müssen wie z.B. “learner characteristics”, “content”, “skills”, “learner support”, “resources”, “assessments”. Technologien, Plattformen und Tools haben zudem das Spektrum an Möglichkeiten erweitert, effektive Lernumgebungen zu gestalten. Mit fließenden Übergängen zum Stichwort PLE (personal learning environment). Your Subject Matter Expert is an integral part of the eLearning team. They offer their expertise during the online training content curation process and help narrow down the key goals and objectives. But they can also be a valuable asset during kickoff meetings, feedback sessions, and online training course launches. Here are 7 tips that can help you tap into the experience and talents of your Subject Matter Expert in your next corporate client meeting. Enlist the aid of the RIGHT Subject Matter Expert. Subject Matter Experts tend to specialize in a specific field or niche. Therefore, it’s important to choose a Subject Matter Expert who has the expertise in the particular industry that pertains to your client. For example, you wouldn’t want to bring a life science Subject Matter Expert into a meeting that deals with physical science. They may know about a great deal about the general topic, but their experience does not lie within that targeted niche. Aside from their knowledge, you should also opt for a Subject Matter Expert who has the right disposition for the meeting. If they are typically boisterous then they may not be a good match for a client who is quiet and reserved, for example. Prepare them for what to expect in the meeting room. Even the most experienced Subject Matter Experts still need to be prepared beforehand. This is due to the fact that every meeting is different to some degree, even if you are working with the same client. Be sure to clarify their role in the meeting, what you expect them to discuss, and how they are going to contribute to the discussion overall. They should also know as much as possible about the situation, such as who is who and what topics will be covered. Determine the goals of the client meeting beforehand. Your Subject Matter Expert should be completely aware of what you hope to achieve by the end of the meeting, whether that be landing a new project or clarifying the eLearning course objectives. This is also the time to get their input and ask if they have any goals they would like to meet, such as learning more about the specific needs of the client before proposing the online training content. You may even want to supply them with a checklist of objectives that you want to cover during the meeting. If the goals are more in depth you can give them a detailed overview of the steps involved and how you are going to check them off your list. Research the client’s background prior to the meeting. Collaborate with your Subject Matter Expert to learn as much as possible about the client, including their mission statement, training initiatives, and history. You can typically find a wealth of resources online by visiting their website, LinkedIn profiles, and other social media pages. Look for any clues that might tell you what they are looking for and their professional traits. For example, are they tech-forward or do they prefer more traditional training methods? Researching their background gives you the opportunity to step into the meeting well informed and organized. You are also more likely to address their specific needs if you can identify their current training gaps. Ask the Subject Matter Expert to create examples for the client’s review. It’s always a good idea to head into a client meeting with something to show, especially if the client is new to online training and may still need some convincing. It’s also a great approach for clients who are unsure about what they truly want or need their online training program to contain. Ask your Subject Matter Expert to create a draft outline of the content to be included in the online training course and/or several examples that you can put on display. It doesn’t have to be anything detailed or elaborate, just as long as it gives them a clear idea of the options you have for them. Discuss the details of meeting after the fact. After you’ve stepped out of the meeting you should set aside some time to talk with your Subject Matter Expert. You can discuss the highlights and address concerns that either of you might have. This is also an opportunity to talk about how you are going to proceed and prepare for the next client meeting, if necessary. Go over each of the goals and objectives you set beforehand and determine if they were fully met. If not, then discuss the steps that you must take in order to achieve them. Make sure that your Subject Matter Expert knows about this post-meeting conference in advance so that they can make time in their schedule. Don’t forget to appreciate all of their hard work. Your Subject Matter Expert has taken the time to attend the meeting, prepare beforehand, and recap all of the details afterward. As such, they deserve a pat on the back and a show of gratitude. Thank them for all of their hard work, and ensure that they know how much you appreciate their efforts. Even experienced experts who have been in the field for years like to be praised every now and then, especially when they go above and beyond by making it to the client meeting. The expertise, abilities, and skills that your Subject Matter Experts bring to the table can be of great value to you in the boardroom. The next time you're meeting your corporate client, why not bring your Subject Matter Expert along to make it even more productive. Are you finding it difficult to work with your Subject Matter Expert? Read the article Working With Subject Matter Experts: The Ultimate Guide to learn how to work more effectively with your Subject Matter Expert and overcome the most common challenges.